Most organizations do not take the time to define a print strategy, because it is time consuming and falls low on the priority list. A lack of strategy can cost a lot of money in the long run. The costs associated with printing can add up to between 1-10% of an organization’s total revenue. Putting a print strategy in place that effectively monitors and manages your fleet of equipment can provide your organization cost savings of up to 30%. Experienced managed print services providers have mastered efficiency in this field, providing the knowledge and expertise to perform these tasks efficiently and accurately. This allows your internal staff to stay focused on their priorities without print technology interruptions. Managed print services programs will monitor your supplies and can automate ordering and delivery when they are getting low. Monitoring is done through software on your equipment and notifies your MPS provider via email, so you never have to worry about running out of supplies. This will save time for your purchasing personnel, not only because they won’t have to physically order supplies, but because your MPS provider will be your only vendor. A MPS program will streamline processes and take the busy work away from your internal staff. 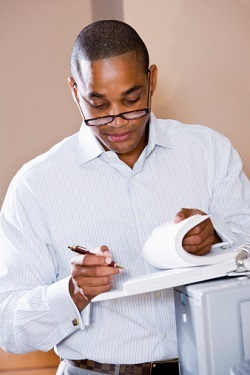 The only supplies not provided through most managed print services programs are paper and staples. Most MPS programs include on-site service and repair and parts replacement. Unique to a few MPS providers is the equipment replacement element that, if the costs for repair are higher than the value of the machine, a new piece of equipment will be provided, at no cost to you. The programs should also include any travel time and labor required to service your machines at your location. Also unique to some MPS providers is user help desk support. This service includes access to experienced, technology savvy representatives during normal business hours. They will help you work through printing, scanning, copying, faxing and basic network connectivity issues. Additionally, an effective help desk is equipped to help you work through and adjust to new or upgraded software on your equipment. An initial assessment will be done to determine the types and locations of your current printer fleet and where improvements can be made and costs can be reduced. If you choose to implement a managed print services program, all of your activity will continually be monitored and tracked, and can even be tracked by department or user. A routine device usage report will automatically be run to show how effectively your business is using your equipment. You can track and compare this information against previous reports to view improvements, additional inefficiencies and overall use and productivity. Your managed print service provider should also perform a recurring business review to monitor your print strategy to ensure it still aligns with your business initiatives. If your organization has grown, your print strategy may need to be tweaked to include additional equipment or movement of resources. If you wish to bring more outsourced print projects in house because your demand for these types of projects has increased, you may need to consider additional equipment that can print higher quantity and quality. Your print strategy should change with your business growth, evolution and transformation. Managed print services programs take the frustration and inefficiencies out of your hands and puts it into the hands of a company equipped with a team of print professionals to fully monitor and manage all of your printing needs. Talk to a Marco technology advisor to see how you can benefit from a managed print services program designed just for you.